To find manuals, specifications, quick start guides, firmware and contact information. For North America TV product phone technical support. To find helpful product information you will need the model number of your product which can be found on the product on the rating label. Once you have located the model number CLICK HERE and (1) enter your model number then (2) select Manuals & Specs to find the (3) User Guide, Spec Sheet or Resource Guide. For the most up to date help consult the Users Guide for your TV. 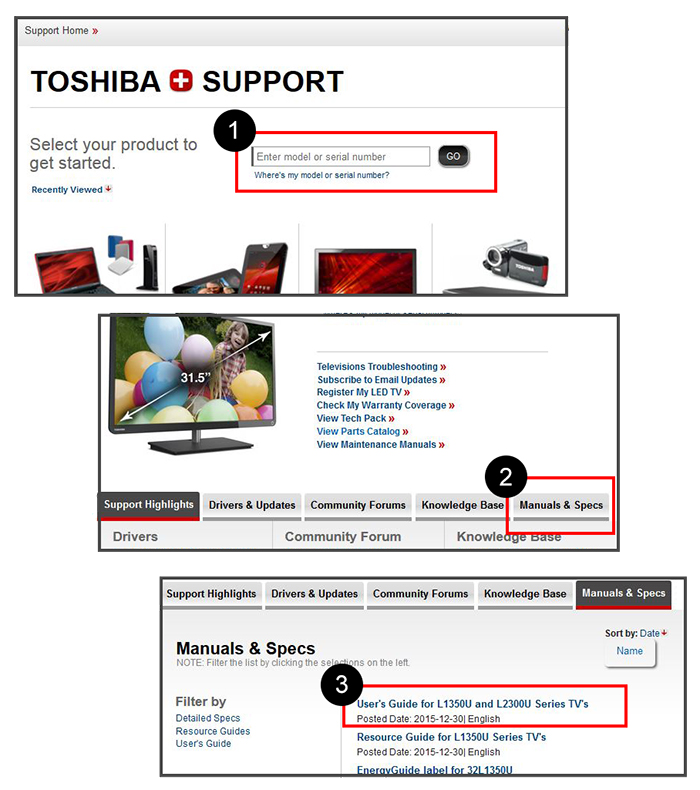 For your convenience Toshiba offers an online userguide for your viewing. CLICK HERE and (1) enter your model number then (2) select "Manuals & Specs" and then (3) select User's Guide. The chapter of interest will be titled similar to "Menu Layout and Navigation"
Information regarding using your remote control can be found in the Online users guide for your product by CLICKING HERE, entering your model number, going to Manuals & Specs and then selecting User's Guide. The chapter in the users guide that would be helpful is titled "Using the Remote Control"
An electronic glitch in the remote. Open the battery compartment on the back of the remote and remove both batteries. Press and hold any button on the remote for 20 Seconds. Release the button and reinsert the batteries properly. If the remote works, there was a glitch in the remote that was cleared when you discharged the remote in the prior step. If the remote does not work, continue on. If the remote works, your original batteries are dead. Continue using with new batteries. If the remote does not work, there may be something wrong with the remote or with the remote sensor on the TV. Continue on. To test the remote control and the remote sensor, perform one of the following tests: Digital Camera test or Another remote on this TV. Aim the remote at the lens of the camera from about 6-10 inches away. Press any button on the remote. You will see the Infra Red eye of the remote flashing on the LCD screen of tour camera if the remote is working properly. If the above test indicated the remote is working, the problem is in the remote sensor on the TV. If the above test indicated that remote is not working, you have a defective remote. Make sure that the second remote is in the TV mode. Press [Power] on the remote and see if it turns the TV on. 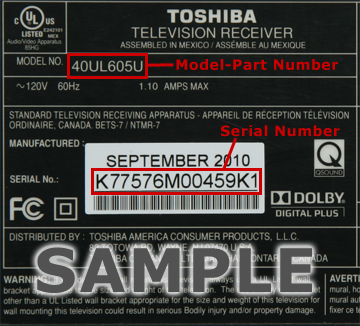 If the TV turns on, the problem is in your Toshiba remote. If the TV does not turn on, the problem is in the remote sensor. Below are many videos that can help you with common problems.